I have one in the bank. Too bad we stoppped doing POP shortly thereafter. Xegony on our second kill Essence of Wind dropped, I got it...but will I ever get the other 3 I need? How rare is this? In an up and coming elemental guild and current blast all the competition away in dpk. Do the Elemental gods drop these "essences" everytime, or is it semi rare? I actually had my sights set on the cord of invigoration for some time now. I'd say quite rare. We've killed Xegony several times, and essence of air never dropped. 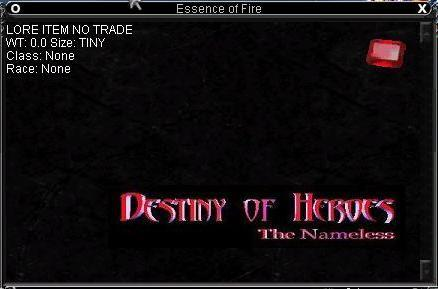 Killed Fennin Ro 5 times and essence of fire has only dropped once. Somewhat rare, on 5 fennin kills he only dropped it once.